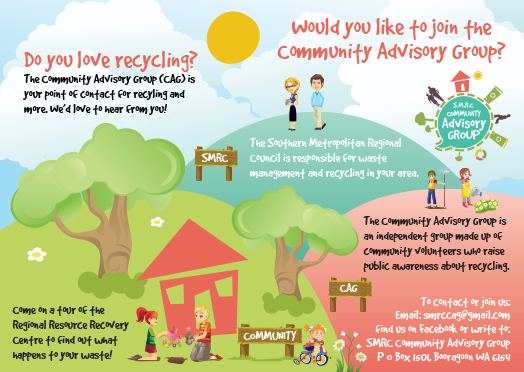 Your May Issue Recycle Right Newsletter is here! Remember that old mobile phone, laptop computer, or analogue television you threw out? Did you ever give a thought to what happened to it once it ended up on the scrapheap? 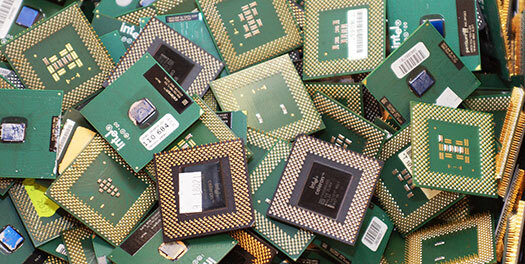 Electronic waste, or e-waste, has become a universal waste conundrum. A recent United Nations University (UNU) study reported that an estimated 42 million tonnes of â€˜e-wasteâ€™ goes to landfill across the globe each year. By placing e-waste in landfill, valuable components are unable to be recycled, not to mention the damage to the environment as the materials painstakingly break down. A percentage of this e-waste comprises a dangerous amount of toxic waste such as lead compounds, as well as precious metals such as silver and gold. Of the 42 million tonnes of waste, 1,000 tonnes are silver and another 300 tonnes gold. Sadly, itâ€™s believed only 16% of globally produced e-waste is being properly processed and recycled. The UNU study estimates the value of wasted e-waste resources to be around $50 billion. Most electronic waste is generated by developed economies. African nations, sometimes the final destination of e-waste, ironically generate the least e-waste with just 1.7kg per person. 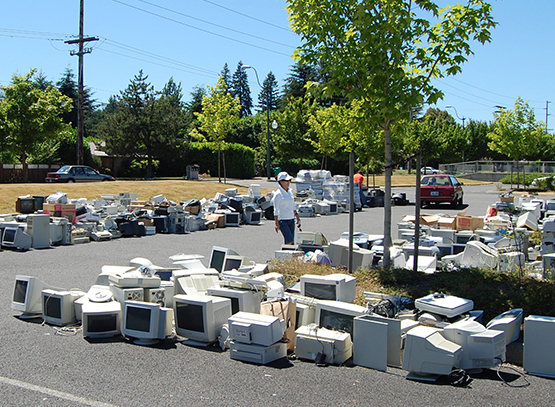 â€œWorldwide, e-waste constitutes a valuable â€˜urban mineâ€™ â€“ a large potential reservoir of recyclable materials,â€ UN Under Secretary-General David Malone said. In Australia the National Television and Computer Recycling Scheme aims to improve television and computer recycling rates to 80% by 2021-22. The scheme provides Australian households and small businesses with access to free recycling services for televisions and computers. Itâ€™s funded and run by industry as part of their product stewardship responsibilities. As part of the scheme you can drop off your old computers and accessories at participating retailers such as OfficeWorks and televisions at Harvey Norman outlets and select recycling drop-off points. For more information and a list of your nearest drop-off points for unwanted electronics, visit the Recycle Right website or download the app from iTunes or Google Play stores. 181,000 tonnes of televisions and computers are expected to be discarded by 2027. From 2013 to 2014, over 40,000 tonnes of televisions and computers were collected and recycled under the National Television and Computer Recycling Scheme in Australia â€“ equivalent to the weight of four Eiffel Towers. Photo: Tony Iannello, Deputy Chairman Water Corporation; Cameron Schuster, SMRC Chairperson; Vincent Catania, MLA. 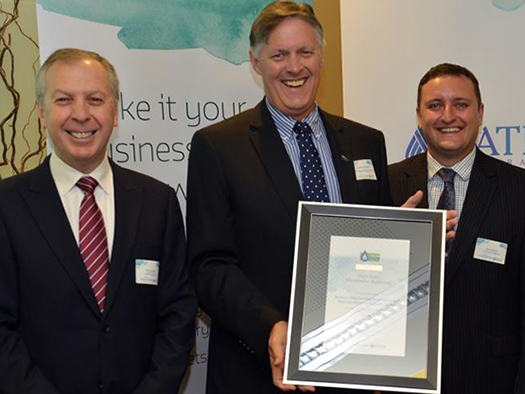 The Southern Metropolitan Regional Council (SMRC) has been recognised for its water saving measures at the Regional Resource Recovery Centre (RRRC), recently receiving a Gold Award from the Water Corporation. More than 330 Western Australian businesses saved a collective 14 billion litres of water in 2013-14, thanks to their participation in the Water Efficiency Management Plan program. Water Minister Mia Davies said the program helped 338 businesses to reduce their water use. â€œIn 2013-14, these businesses saved a collective 14 billion litres of water â€“ which is the equivalent of 6,222 Olympic swimming pools,â€ Ms Davies said. CAN I RECYCLE: ALUMINIUM FOIL? Yes. 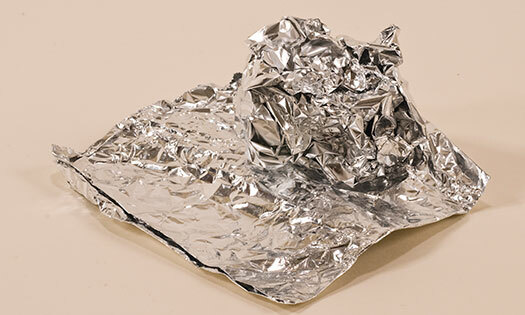 Clean aluminium foil should be placed in your yellow-topped bin. If the foil has a lot of food waste stuck to it, place it in your green-topped bin to avoid contamination of other items in the yellow-topped bin. Dont forget to scrunch all the pieces into one ball. WILL YOU GO PLASTIC FREE? Plastic Free July poses a simple yet ambitious challenge â€¦ attempt to refuse single-use plastic for a month. The initiative aims to raise awareness of the amount of plastic in our lives by encouraging people to consciously make a decision to avoid single-use plastic. Most disposable plastic items are designed solely for convenience and are discarded after their initial use. In one week we use 10 billion plastic bags worldwide, with the vast majority of these ending up in landfill or the ocean. Families, individuals, schools and businesses are encouraged to accept the plastic-free challenge to reduce their individual consumption and kickstart a greater awareness of waste. And while weâ€™re talking about disposable plastic, the City of Fremantle has submitted their â€˜Plastic Bag Local Lawâ€™ for State Government consideration. The law will prohibit retailers from providing singleâ€“use nonâ€“biodegradable plastic bags to shoppers. If approved, the City of Fremantle would become the first local government in Western Australia to implement the law, which is already in place in other parts of the country. Itâ€™s easy to live without plastic bags â€“ just say NO and make reusable shopping bags a habit whenever you go shopping. By reducing your waste you can save raw materials, natural resources and some money too. This will also prevent many of these resources being wasted in landfill. When you shop smart you can drastically reduce the waste of your household. Aim to buy in bulk and look for products with refillable containers. Buy quality goods and mend when necessary. Refuse single use products such as plastic water bottles, plastic bags and disposable coffee containers. Have you ever heard the saying â€œone manâ€™s trash is another manâ€™s treasure?â€ It is possible to reinvent old items so they have a new life, rather than going into landfill. Take a fresh approach to old items â€“ use old sheets and clothing as rags, reuse jars as storage containers and donate unwanted items to charity or sell online. Did you know that 95% less resources are used when you recycle an aluminium can, compared to producing a new one? By recycling materials, far less natural resources and energy are consumed compared to using raw materials. Another way you can support recycling efforts is to purchase products containing recycled content. It is also possible to recycle in your backyard! You just need a compost bin or worm farm. 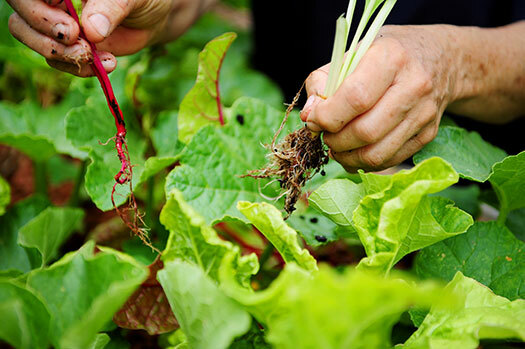 By mimicking natureâ€™s recycling process of decomposition, we can unlock and recycle the nutrients of our organic waste and process it back into our gardens. Much of what we throw away each week is food scraps and garden waste. By recycling this waste in our backyards, we are improving soil quality, avoiding landfill and toxic greenhouse gas emissions. 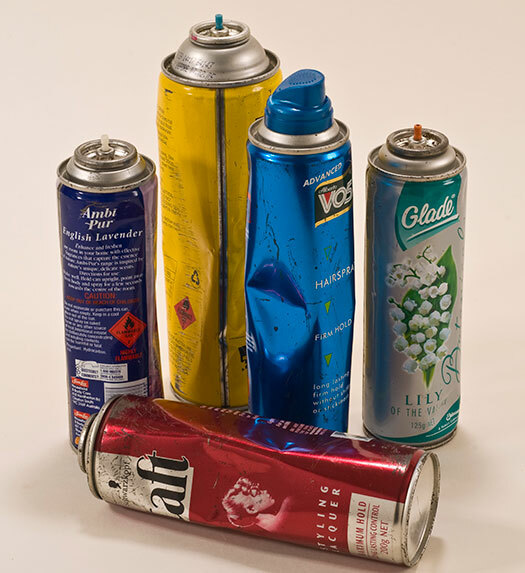 CAN I RECYCLE: AEROSOL CANS? Yes. Empty aerosol cans should be placed in your yellow-topped bin. Please make sure the aerosol is empty of its contents and do not pierce the can. 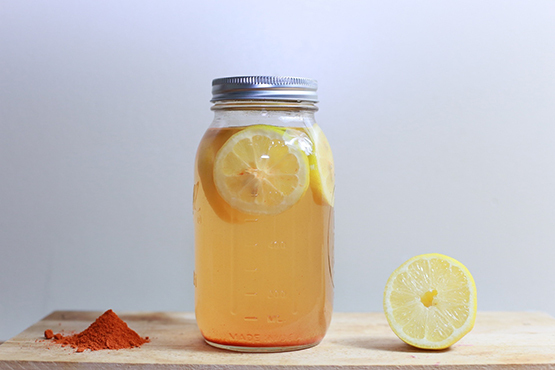 If the can has a plastic lid, remove the lid and place this separately in your yellow-topped bin. 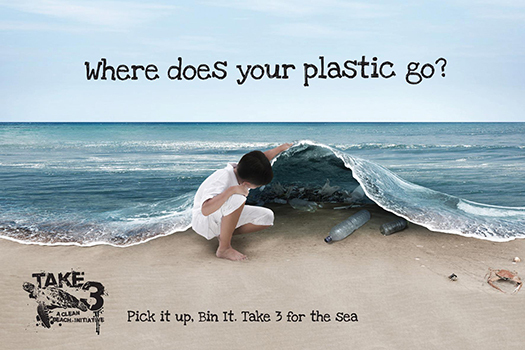 Take 3 is a not-for-profit organisation that aims to raise awareness of marine debris by encouraging visitors to beaches, waterways or... anywhere, really, to simply take three pieces of rubbish with them when they leave. Marine debris, particularly plastic, has a disastrous impact in our oceans. We can significantly reduce marine debris in our oceans by preventing it from getting there in the first place! Take 3 encourages people to refuse disposable plastic, reduce, re-use, recycle and respond by picking up rubbish. Photo: Education Officer Emma Baker with Maureen Maher, Sam Culbertson and Jen Watson. 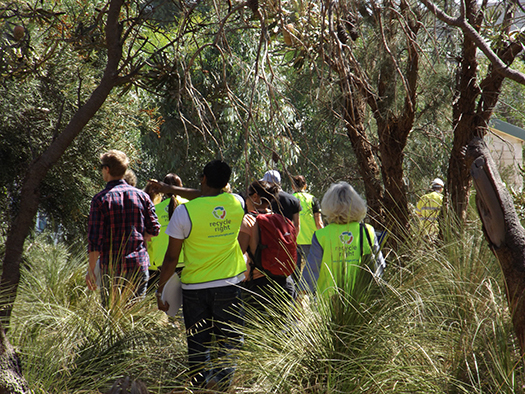 The RRRC had special guests from Keep Australia Beautiful (KAB) and Waste Wise Schools earlier this month. KAB Clean Schools Coordinator Sam Culbertson said understanding the waste process from a postconsumer product to a recyclable material is important and ensures waste educators are on the same page. â€œWhile minimising waste in the first place is an important first step, a key part of a litter-free environment is correct waste disposal. This is where recycling and the Recycle Right message comes into play. All waste educators should take the tour,â€ Ms Culbertson said. World Environment Day (WED) encourages worldwide awareness and action for the environment. Over the years it has grown to be a broad, global platform for public outreach that is widely celebrated by people in over 100 countries. It also serves as the â€˜peopleâ€™s dayâ€™ to do something positive for the environment. The theme this year is â€œSeven Billion Dreams. One Planet. Consume with Care.â€ The wellbeing of humanity, the environment and the functioning of the economy ultimately depends on the responsible management of the planetâ€™s natural resources. And yet, evidence is building that people are consuming far more natural resources than what the planet can sustainably provide. Consuming with care means living within planetary boundaries to ensure a healthy future exists for everyone. 500 billion disposable cups are manufactured globally every year. That is almost 75 cups for every person on earth. Every minute over one million disposable cups are discarded in landfill. 98 tonnes of resources are used to make one tonne of paper. Very little recycled paper is used to make disposable cups because of contamination concerns. Most are lined with polyethylene which compromises the recycling process. The plastic lining also means cups take a long time to break down. If you use one disposable cup every day for a year, you will consume 1kg of plastic. Refuse. 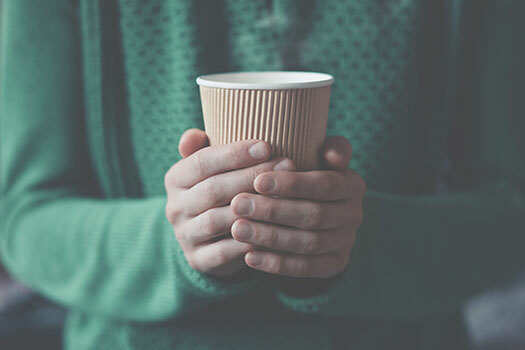 Use a reusable coffee cup instead, which can be purchased at many reputable outlets. Reusable coffee cups reduce the impact disposable cups have on our environment. You will reduce your waste footprint, use of virgin resources and reduce greenhouse gases when using a reusable cup. Drink your coffee in the cafÃ© in a mug. The taste is better and it provides an invaluable â€˜time-outâ€™. 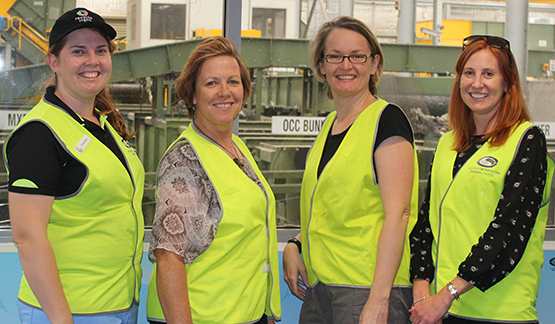 Early in March, Belinda Creswell toured the RRRC with an interest in learning more about recycling. Belinda is a member of Toastmasters, a public speaking organisation and was so enthused by the tour that she chose to use it as the topic for her recent talk. Belinda set about to inform the audience about the Materials Recovery Facility and to persuade them to â€˜Recycle Rightâ€™. She answered her opening questions and concluded with the information that the RRRC diverts over 70% of waste from landfill and is committed to improving this figure, in line with the Waste Authority of WAâ€™s aim of Zero Waste by 2020.
â€œI want the audience to value recycling at home make more effort as it really does affect the environment,â€ Belinda said. Many visitors find the tours of the RRRC educational and inspiring to make changes in the household to avoid waste and recycle. Weâ€™d like to congratulate Maureen Smith for winning one cubic metre of compost, which was generously donated by SMRCâ€™s compost partner Nutrarich as part of International Composting Awareness Week (ICAW)! All tour visitors in the month of May were entered into the draw for the compost give away. ICAW provides a week of activities and events to promote awareness and use of compost. Compost helps curb carbon pollution by diverting organic materials from landfill. It also helps ensure soils are healthy and productive. Congratulations again Maureen and happy gardening.